Trader Joe’s has long offered some of the lowest prices for groceries, but that could soon change. There’s a new competitor now that’s almost as cheap: Whole Foods. Whole Foods’ new chain, 365 by Whole Foods Market, is only about 4% more expensive than Trader Joe’s — and that’s not including 365’s loyalty program discounts — according to a recent price check by Wedbush Securities. The first 365 location opened in Los Angeles last month. Analysts compared a basket of about 100 items at 365 to a basket of similar items at nearby supermarkets including Trader Joe’s, Sprouts Farmers Market, Vons Supermarket, and a traditional Whole Foods store. 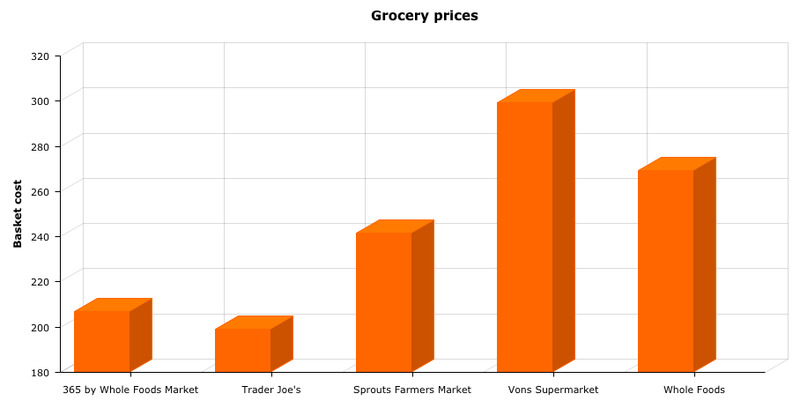 While 365 was slightly more expensive than Trader Joe’s, it was 14% cheaper than Sprouts, 31% cheaper than Vons, and 23% cheaper than a traditional Whole Foods store. The baskets cost $207 at 365, $199.03 at Trader Joe’s, $241.54 at Sprouts, $299.50 at Vons, and $269.39 at Whole Foods. Analysts said the basket at 365 would have been even cheaper if they had accounted for discounts through 365’s new loyalty program. They also suggested that 365’s private-label offerings are higher quality than Trader Joe’s. “We attribute the majority of pricing differential to difference in quality, sustainability, and other traits (non-GMO, etc.) of private label offerings,” analysts wrote. 365 was cheaper than all the other stores in every single category except meat, according to the study. 365 had an average premium of about 1% in the meat department compared to competitors. “365 pricing appears to be doing its intended job: to become increasingly price competitive to small-format value-oriented peers,” the analysts wrote.